Rubicon Global is a technology company providing waste, recycling and smart city solutions to businesses and governments worldwide. Rubicon partnered with Sustainable Brands to judge Waste Fit award submissions. The award winners were judged based on their emphasis in waste reduction practices implemented in their respective organizations, circular economy practices and the impact these solutions are having on their business. Phil Metro of Superior Essex's Hoisington, KS manufacturing facility was recognized for his amazing contributions to execute Hoisington's Zero Waste to Landfill program. The Hoisington facility is still the only zero waste to landfill certified site of its kind, and with this award, continues to be recognized as a model for sustainable manufacturing practices. Superior Essex's Red List Free Products and Digital Building Technology application were recognized as a Top 10 Product by BuildingGreen, the leading resource in sustainable architecture and design. This award grants Superior Essex Communication Cables this prestigious distinction as a best-in-class trendsetter and sustainability leader for 2019. Finally, the International Living Future Institute, creator of the Living Building Challenge and other leading sustainable product certifications, has awarded Superior Essex with the Manufacturing Visionary Award for 2018, citing their commitment to the ILFI's mission and their leadership as a manufacturer of products contributing to health and wellness in the environment. Superior Essex led an effort to collaborate a group of 40 leading building product manufacturers to challenge the architect and design industry to prefer sustainable products in their specifications and purchasing. Superior Essex is honored to be the recipient of these prestigious awards and will continue to grow and develop products for the sustainability market now and into the future. Superior Essex announces a new Telco OSP Hybrid cable optimized to support Class 2 Line Powering of remote devices while supplying data over fiber optic cable. Targeted at next generation Small Cell deployments and rural CAF-II projects that will be using DSLAMs and PON systems, these cables are ideal for use in both Brownfield and Greenfield applications and make use of 25 pairs of 22 AWG twisted copper pairs and up to 192 optical fibers. We are thrilled to introduce an innovative cable design that offers the capability to deliver power and fiber under one jacket deep into the network," says Robin Gainsford, Director of Broadband Technology for Superior Essex. "We look forward to showcasing this particular cable and other hybrid products at ISE this year." The Telco Hybrid OSP Cable will be on display from August 14-16th at the ISE 2018 trade show in Denver, CO, where Superior Essex will be exhibiting from booth #423. Superior Essex has received an Outstanding Case Study Award from the Sustainable Purchasing Leadership Council (SPLC). The Award was given on Wednesday, May 16 in recognition of the Superior Essex lighting retrofit in the historic West Baden Springs Hotel and the case study subsequently contributed to SPLC's online library. These awards recognize organizations for documenting their sustainable purchasing efforts in detailed case studies, enabling others to follow their lead. Superior Essex, a leading manufacturer and supplier of communications cabling products, is excited to announce that it has joined Platformatics, a leading innovator in intelligent lighting solutions, in the retrofit of the West Baden Springs Hotel in French Lick, Indiana. Seeking to boost operational efficiencies and improve its user experience, the Cook Group, which owns the French Lick Resort, sought the expertise of Superior Essex and Platformatics in converting its lighting infrastructure to the latest intelligent LED lighting technologies. Together, they provided a connected lighting solution that not only offers West Baden Springs Hotel a unique user experience and greatly improved energy efficiency, but also establishes a foundation for future converged network applications that will continue to add value as the hotel expands its in-building network. The West Baden Springs Hotel is one of America’s oldest and most treasured resort hotels, with a history that stretches back more than 100 years. Its domed atrium, often called the “Eighth Wonder of the World,” is remarkable for both its size and aesthetic and serves as one of the hotel’s main attractions. Previously, the dome was equipped with a lighting system that was both inefficient and difficult to customize, repair and maintain. With the new system provided by Superior Essex and Platformatics, the dome now includes over 500 tunable, IP-ready lights that are interconnected over a single local area network (LAN) by more than 30,000 feet of Superior Essex PowerWise® 1 Gigabit 4-pair Power-over-Ethernet cabling. This new solution offers a myriad of benefits for the hotel, including data gathering and analytics, ease of use, improved energy efficiency, occupant health, safety and productivity. “The connected lighting solution provided for West Baden is a great example of how technology and architecture can be blended together to produce a truly unique user experience, while also adding value in terms of operational efficiencies,” says Will Bryan, Vice President of Technology and Market Development for Superior Essex. Read the full story of the West Baden Springs Hotel lighting retrofit in the August 2017 issue ofCabling Installation and Maintenance Magazine, available in print and on its website. You can also watch West Baden Lights, a short documentary which highlights the West Baden Spring relighting project, available on the Superior Essex YouTube channel. For more information about the West Baden Springs Hotel, visit its website. For more information about PowerWise products, visit the PowerWise website. Superior Essex, a leading manufacturer and supplier of communications cabling products, announced today that its PowerWise™ Cable and Digital Building Application products received Top Product of the Year in the Environmental Leader and Energy Manager Today Awards. The annual award recognizes excellence in products and services that provide companies with energy and environmental benefits. One judge said of PowerWise Cable and the Digital Building Application, "the Superior Essex product is well thought out and reduces energy while enhancing the user experience. Bonus points for manufacturing in a zero waste-to-landfill plant." The built environment is smarter, more adaptive and unified like never before and requires cabling that is just as efficient and versatile. To meet these demands, Superior Essex developed PowerWise, the leading-edge Power-over-Ethernet cable suite. This solution helps customers optimize, customize and unify their enterprise space while offering improved energy efficiency, occupant health, safety and productivity. A leader in environmental performance, Superior Essex products contribute to all green building standards, including LEED, WELL Building and the Living Building Challenge. "We are honored to be recognized by Environmental Leader and Energy Manager Today for the environmental performance of our PowerWise Cable and Digital Building Application products," says Eric Perry, Superior Essex Vice President - Engineering Services and Quality. "These technological solutions reflect Superior Essex firm belief that the products which interconnect the world must also respect it." Superior Essex is excited to announce that it has been recertified as Zero Waste to Landfill for the third consecutive year! 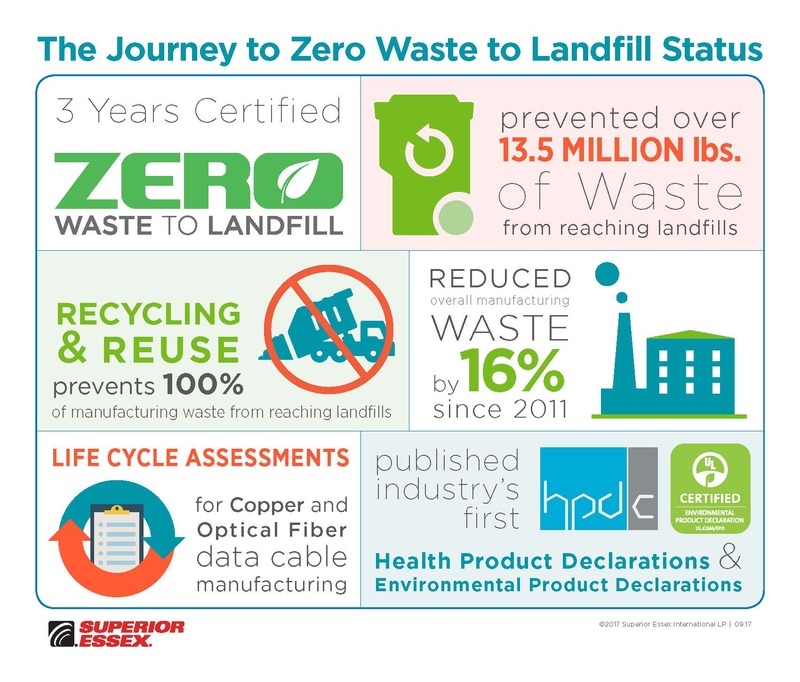 When the company originally received its Zero Waste to Landfill certification in 2015 for its cable manufacturing facility in Hoisington, Kansas, it was the first Zero Waste certification ever achieved by a communications cable manufacturer. Since 2015, the company has continued maintain its Zero Waste to Landfill status for three consecutive years, preventing over 13.5 million pounds of waste from reaching landfills. Zero Waste to Landfill certification is a means of recognizing the achievement of a 100% landfill waste diversion rate. Landfill waste diversion, defined as the prevention and reduction of generated waste through source reduction, recycling, reuse, or composting, has been characterized as one of the best ways manufacturing companies can demonstrate genuine environmental responsibility. Superior Essex was awarded its Zero Waste to Landfill certification by GreenCircle Certified, LLC., a prominent third-party certifier of environmental claims. The journey to zero waste status took nine years for Superior Essex and required several wholesale manufacturing changes within the company. The company has also reduced its manufacturing waste by 16% since 2011, and continued to reduce certain types of manufacturing waste such as scrap FEP wire and reprocessed FEP waste by 12.27% and 6.05% by weight, respectively, which contributes to an overall environmental impact reduction of its operations. A true zero waste facility accounts for the potential waste created throughout its entire downstream process, including that of third-parties who are involved in the recycling and reuse of waste materials. For Superior Essex, it must continuously ensure that the companies it uses to recycle scrap metal, wood, plastic and other materials are not sending their waste by-products to a landfill. As a global leader in the design, manufacture and supply of a wide range of cable products, Superior Essex has a broad line of multimode and single mode optical fiber cables available for virtually every application. The optical fiber cables are manufactured and tested to ensure that all fibers meet Superior Essex optical specifications in a state-of-the-art facility in Brownwood, Texas. For more than 50 years, Superior Essex has designed and manufactured one of the broadest portfolios of premises copper cables available on the market. From Augmented CAT 6 cables to CAT 3 Station Wire, to Residential Broadband to Coax cables, its voice and data cables are essential components for high-bandwidth applications at leading enterprises around the world. Designed for indoor use in central offices or premise telephone rooms, Superior Essex Central Office Copper cables are designed to provide high bandwidth for a variety of applications and distances. These tinned copper cables have been the preferred choice of large telcos and OEM cable assembly companies for years. Contact your local Accu-Tech representative to learn more about Superior Essex.